I’m determined though to fulfill both pastimes as best as I can. I’ve been a gearhead for as long as the mind can recall. I occupy my days off at Cars and Coffees, having engine oil run the length of my arm and delude myself of adventure by making small roadtrips beyond the city limits. I bring my camera, and I like to take pictures. To set the scene, I’m essentially an extremely middle-class kid who works a day job so I can try to play with cars and go places. However, early on in 2016 I made plans for a big summer trip. I decided I’d like to try and throw something grand together in an effort to do as much car stuff and travel stuff as possible in a given amount of time. This time there would be no silly Cars and Coffees or quick runs to a destination barbecue shack. I was going to save up and try to do something truly neat. This was going to be a sizable trip, and this was going to be an adventure. Hindrances in anything of course don’t simply come in the form of financial roadblocks but also in time constraints. The average American corporate job allots a relatively limited time away from the desk every year. Me? I get two weeks vacation. I take what I get and I’m grateful for it. So I set off in August 2016 and in two weeks I managed to attend Car Week in Monterey, visit a few car friends in Los Angeles and Atlanta, travel to Germany, drive on the Autobahn, and then hit France, Luxembourg, Belgium and the Netherlands along the way. In two weeks, I would talk to someone about the Nurburgring in California and then drive on the actual thing a week later. In two weeks I would see many of the world’s most expensive and exclusive cars, several times over. I would drive over half a dozen cars, a few that aren’t even sold in the U.S. I would come to meet people I’ve only been familiar with on social media. And in two weeks I would also end up being in some of the most miserable situations I have nearly ever experienced. For each leg of the trip I’ve listed the cars I had the privilege of driving or riding in. As this ended up being a longer read than I expected, I’ve split the entire thing up into six parts. The entire journey sets off from my humble abode in Austin where I would be joined by my long-time friend Cam from Atlanta (unfortunately not short for camshaft). We’d arrive in San Jose, California, grab our rental car, and head straight for Monterey. Right off the bat I, at least somewhat advertently, established that this trip would not go easy. Monterey or Pebble Beach Car Week, for the uninitiated, is an annual automotive phenomenon that takes place around the Monterey Peninsula. It hosts one of the world’s most prestigious car auctions (the Pebble Beach Concours d’Elegance) and many other high profile car events. Indeed, it is an event that draws many of the wealthiest car enthusiasts in the world. This of course creates a demand in the area that skyrockets the cost of visiting, even for Monterey which is a place where many retired plutocrats call home. Accommodation for the week was not affordable, at all. For example, your average Motel 6 complete with meth needle decor can easy fetch over $400 a night even just outside the vicinity during Car Week. Airbnbs book up months out. I had friends in the Bay Area but combined with Bay Area traffic and distance, the solution rendered useless. We wouldn’t be staying long for this leg of the trip, but we still needed a place to rest our heads. It was then Cam suggested we can try camping as a solution to the costly accommodation. Camping? It was something I hadn’t considered then. Bringing tents with us on the plane would be a bit of a hassle. Buying tents once we arrive wouldn’t be cost efficient either. “What if we just slept inside the car?” Cam devised. Our nervous laughter at the idea quickly turned to silence and then we soon realized, this was for real. This was going to be us. We were going to be homeless because we couldn’t actually afford attending Car Week. Son of a good loving mother. Thanks to the eclectic selection of cars from Turo, we found ourselves a very cool BMW E61 535xi touring (I am not endorsed by Turo). BMW nomenclature decrypted, we had on our hands what was essentially a 300hp BMW wagon. It would have some kick to it and we could sleep in the back. It was perfect. The first night in Monterey came quicker than it arrived. We first had to find a place to park the car overnight where one, we wouldn’t be harassed by local law enforcement and two, wouldn’t get shot. Our best bet ended up being a residential neighborhood just far enough from any particular residence. We figured at worst we would just be mistaken for two homosexual men who happened to be homeless in a late model BMW wagon, a situation that shouldn’t be too far-fetched for most Californians. Verdict? If you’re seeking a true adventure, substitute soy milk in your cereal if you have to, but do not sleep in the back of a BMW wagon. Unbeknown those who have never gone, Car Week is actually a place to go where car enthusiasts can become desensitized to all their wildest automotive dreams. The literal amount of fantasy cars that litter Monterey during the week is downright absurd. It is a place where cars you’d expect to see once in a lifetime are replicated by the handful. For the car lover, it is one wild acid trip realized. An example comes in the form of Lamborghini’s legendary classic Miura. The Miura is an incredible sight to behold alone by itself, but this year Lamborghini and its private owners managed to put on a display of nearly two dozen of them at the Quail. We arrived at the tail-end of preparation day and caught the cars at dusk. Bugatti makes some of the most expensive and exclusive production cars in modern times. That of course meant bringing out their product by the multiple. Unfortunately I wasn’t able to see their new Chiron uncovered. I also had a first encounter with Sweden’s little powerhouse of a hypercar maker, Koenigsegg. I’ve dreamt of seeing one in person since my high school days. Car Week actualized that dream. Their new Regera was an absolute spectacle. At Laguna Seca, we visited the world renown corkscrew and watched legendary racers being flung about. Most of these cars are ones that are immortalized in the greatest tales of motorsport. To watch and listen to them come alive was... well, it was absolutely breathtaking. BMW North America was generous enough to offer all of its flagship vehicles up to experience at its Pebble Beach villa/tent/private function thing. We figured as their E61 wagon punished us in ways we wish not to relive, we’d take compensation in form of quick stabs of the throttle in its new and very hyped M2 and M4 super coupes. Was it worth the pain of sleeping in the back of a wagon? Well that’s something I’d hate to admit. While BMW M cars are best experienced on brisk winding roads, we really couldn’t complain about having a quick go on the slow but arguably most gorgeous stretch of road on the west coast, the Pebble Beach 17-mile drive. These new M cars feel nothing like their predecessors, but that wasn’t necessarily a bad thing with how much torque comes on so quickly. While piloting my new Austin Yellow M4, I was followed by a Lamborghini Huracan in the rearview mirror. At that moment I knew I was given a glimpse into a life far beyond my current socioeconomic status. Life was alright then and there. Ironically enough my “exotic” experience in LA began by picking up a rental V6 Camaro, a car one wouldn’t exactly envision to be exotic in any sense of the word. Yet, I was absolutely ecstatic to pick up the car, but not for the car itself. By sunrise I had arrived in downtown LA and I was running on less than an hour of sleep. If there was one place worse than the back of a BMW wagon to rest my head, an upright bus seat would have been a strong contender. A quick Google search reveals that the definition of desperation as behavior that results from rash or extreme behavior. Extreme behavior here accurately describes the irrational joy I found in being able to quickly find a public park, recline my driver’s seat and rest in my newly acquired GM product. Nevertheless, I was in LA to meet a friend I’ve gotten to know over the years through a shared interest in fast saloons. It is a strange twist of events then that two years ago he decided to purchase himself something not very saloon-like at all. The car is very two door, very red and very Italian. Amongst car guys we might refer to them as products of Maranello’s most pompous assholes. For everyone else, they call them Ferraris. We’ll refer to its owner as Mr. K.
Derogatory jokes about effeminate muscle cars aside, I’ve decided it would always be in my best interest as a car lover to maintain unbiased perceptions of cars until I drove them. So off I went to road test the Camaro. I headed up to Big Tujunga/Angeles Crest and later performed a full run down the length of famed Mulholland Highway, popular proving grounds for LA enthusiasts and journalists such as a certain Matt Farah. What was surprising was the car’s very taut chassis and capabilities in carving corners. Driven to a certain extent (within legal bounds of course), the Camaro was happy to keep up with other sports cars and moderately paced motorcycles. However, disappointingly enough what did not surprise was the V6's miserable attempt at delivering an experience that anyone would consider driving a performance oriented car. It was the anchor and Achilles’ heel of the entire thing. It’s not difficult to see why Los Angeles county is an absolute haven for car and motorcycle enthusiasts though. The run down Mulholland Highway toward Malibu was a wonderful drive and even with its popularity, many stretches of the road had little traffic. Despite my Camaro and its incapacitated feeling V6, I adored the drive down the valley. The road consisted of a combination of both sweepers and aggressive, sharp bends. Driving west on Mulholland meant the route would ultimately end back on the magnificent Pacific Coast Highway. Neither of us having driven a McLaren before, Mr. K and I expressed a concern that the 12C would feel something like a dull Nissan GTR in the form of a sleek designer piece. That is to say, the car would feel too clinical and too uninspired. To be fair, I hadn’t driven a Nissan GTR either, but either way hoped McLaren didn’t build a car that felt like boutique refrigerator strapped to big turbos. I’ve driven some cool cars in my years prior, from fast Corvettes like the ZR1 to Mr. K’s own 599. And despite that, I’ve never experienced the exhilaration that comes from hammering down a McLaren. The car felt special as you opened up the butterfly doors, navigated your way into the cabin, climbed over the sides of the carbon tub, and planted yourself into the seat. You would reach up, close the doors, look around, look at the huge 9000 rpm tach staring straight back at you and realize you were in something serious. Then Mr K. decided it would be neat to take me down LA’s famed Rodeo Drive. While I had been in many high dollar cars before, for the first time I reminisced of my childhood and the burning lust I had for them. In my childhood days I remember always being on the outside looking in when something exotic and gorgeous drove by. I remember visiting affluent areas and seeing the Ferraris and Porsches go, pointing out the cars with delight and wondering what it must have felt like to be on the inside. I had always thought the day I get to be that person would be the day I’d find contentment. Then for the express purpose of adding to my list of cars driven, I met up with another friend, Corey, and asked if I can have a go in both his and Andy’s cars. Corey brought out his very modified E92 335i complete with M3 bodywork. On air suspension, it lowers at the push of the button and makes cool turbo braap and pshhh noises. Cam’s workhorse was his Mercedes C230 that he has kept since new. For as long as I’ve known him, he has been an enthusiast of the three-pointed star, but recently his affinities have grown increasingly Bavarian. I wonder why. If there’s a theme attached to this trip (aside from BMWs) it’s one that revolves around sleep deprivation. After an hour and half flight delay, I had arrived in Frankfurt at around 11 am. My mind was jet-lagged and still running on Texas’ central time which would have been 3 am back home. As with buses, I don’t sleep particularly well on planes either. The 9 hour flight to Frankfurt was generous enough to grant me approximately 0 hours of sleep with, at best, brief moments of shut eye. I was running on fumes at this point. My plan for the first leg of Europe was to grab the rental and go on what I like to call a “speedrun trip” — in other words, going as many places and doing as much stuff as possible in a short amount of time. It isn’t exactly a conventional way to enjoy a trip or soak in the sights, but it definitely gets me on my toes and is time efficient. I would be doing this bit of the trip solo which would leave little to slow me down. My first stop was a car dealership I’ve heard about just a few years ago and wanted to visit since then. The place is called Auto Salon Singen and is located on the very southern tip of Germany, almost walking distance to Switzerland. It is known as one of the most incredible car dealerships in the world and constantly stocks some of the rarest vehicles in the book. The drive from Frankfurt? Just a mere 3 hours and change. With the advantage of the Autobahn, I wanted to make it in 2.5. The problem was, I was running on 0 hours of sleep. In the following two days I had to hit Luxembourg and Belgium before making my way across the Netherlands back into Germany, not so much for cars as much as it is to just visit. On the morning of day 9 of the trip, I made the trek over to Luxembourg City from Strasbourg. On my way out I decided to do something I hadn’t ever done in my 12 years of driving. I spotted a young hitchhiking couple on the side of the road who I later found out were homeward bound for Paris. I wasn’t prepared to drive them all the way to Paris but decided to give them a lift to Metz which got them a fair amount closer. So about the car — the Scirocco is easily one of the most enjoyable hatchbacks I’ve driven. It felt like a slightly smaller and less practical Golf with reduced outward visibility but more interesting aesthetics. Despite not having a Scirocco in GT or R trim (I wish), the car still proved to be somewhat peppy and a fair amount nimble. On the journey from Frankfurt I was able to hit an indicated 220 kmh on the Autobahn before the limiter intruded. That’s just shy of 140 mph. Entering the highly populated city of Brussels, I was delighted at the Scirocco’s maneuverability around tight streets and its features that seemed to have been designed with European city driving in mind. It had backup sensors that made parallel parking a breeze and a navigation system that was actually enjoyable to use. I zipped around Brussels, rowed through the manual gearbox and pretended to drive like I lived there. Yet, for as long as I’ve had friends who drove VWs I’ve made jabs at them for their notorious reliability issues. By the time I had left Brussels, drove through the Netherlands and reached Dortmund, Germany on the afternoon of day 10, my Scirocco had performed flawlessly for 1300 kilometers at this point (a whopping ~800 miles in 3 days). And as luck would have it, as I was pulling into the driveway of my Airbnb booking, I started to make a three-point turn and then everything went downhill from there. It seems that if you look for adventure often enough it eventually comes looking for you. Of all the Airbnbs I’ve stayed at over the years, I’ve never had to make a first acquaintance with a host by asking them to push my rental car. Luckily I ended up with some of the kindest individuals who agreed to aid in the reversal of my Scirocco through manpower. They weren’t thrilled at the unexpected exercise but we called it even when they managed to laugh at my misfortune. Car enthusiasts are an opinionated group, but this much almost every car guy can agree on: the little Bavarian company of BMW has developed a solid reputation over the past decades of perfecting the small sports sedan. Praise of its classic E30 3-series is a horse that’s been beaten to a dried pulp. The car needs no explanation and no stage to set. It is the modern classic that auto journalists plead for everyone to drive at least once. 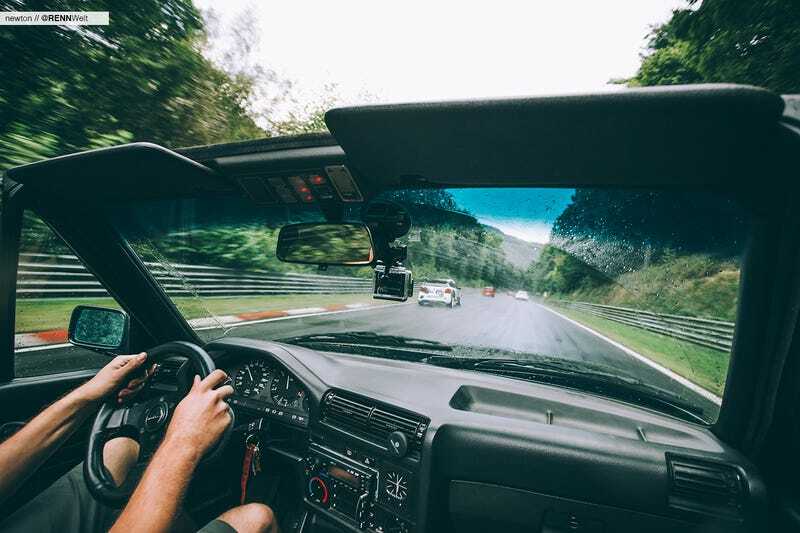 In short, a match made in heaven becomes a phrase that falls short in describing how harmonious the BMW E30 goes together with the Nurburgring. You can visit the Nurburgring in any car you’d like, but you should try and do it once in an E30. One of the primary agendas I had for making the trip back to Germany was to visit Florian and his E30. Florian is guy I met in Austin who hails from the German countryside. He still keeps a 320i convertible in a shed back at his family’s ranch. Our journey would begin from there near the town of Brilon in the German state of North-Rhine Westfalia, some 100 kilometers (that’s about 62 miles and you car guys should know that one) east of Dortmund. The trek to the Nurburgring would be around 300km and take around 3 hours. Normally, this is no challenging task. A three hour drive is one any American can knock out after some morning coffee. However, as with many 25+ year old E30s, Florian’s E30 has seen better days. Its engine has questionable rates of oil consumption, its cooling system breaks a sweat to do its job properly and the entire chassis rolls on suspension and tires that were made from somewhere during some time in history. We should have probably checked before setting off. The first issue with Florian’s E30 is that it had a hood that did not like to stay shut. It would pop open at the faintest notion of a road bump or dip. We had to pull over often to slam it shut. This issue seemed to foretell what would happen next. For most of the trip the car performed well. However, the latter half of the trip was plagued by bouts of stop-and-go traffic and a threatening cooling gauge on the cluster that hovered towards the red. We were only less than 50km away from the Ring when the system gave up the heat. A hose to the coolant reservoir had failed and the clamp barely held on. Once the clamp was removed and re-adjusted, we lost coolant by the liters. The international cheesy pun association would have remarked that we were hosed at this point, but we weren’t going to give up that easily. With no real tools or spare parts, Florian had borrowed a Swiss army knife of sorts from another motorist at the rest stop. He managed to tighten down the clamp and get the hose to stay. The cooling system was running on significantly reduced water and as a desperate attempt to get it working again, we dumped sparkling drinking water into it. Perhaps, we thought, if we drove fast enough we could trick the car into believing it’s air-cooled. I’d like to think the most resilient of machines run on optimism. Yet, we were here at the legendary Nurburgring in BMW’s most winning car. I had asked if we were really going to forego the chance of giving it the proper baptizing after the journey here. Our only other solution was to rent a Ring racecar, something I did when I first visited the track in 2014. However, rent-a-racers are pricey and most of the selections don’t come in the form of an E30. You see the Nurburgring, in addition to being one of the last remaining dangerous racetracks in the world you can drive on, is a very big course. At 21km (or 13 miles) long, whereas weather at the start of the track may be sunlit with dry pavement, it’s easily plausible that a driver would run into a torrential downpour halfway around the circuit. Florian’s E30 had no driving assists and no ABS. The car was a droptop and had no rollover bars to prevent decapitation in the event of a rollover. To make things worse, we had no idea what kind of tires it ran or how old they were. Things got very sketchy, very quickly. Driving BMW’s best on the world’s most renown racetrack became a death wish. To make matters worse, the Nurburgring has recently faced a string of morbid realities. It was home to two fatalities on track just the month prior in July and a spectator death in 2015. The reminder was extremely unsettling. At day’s end, Florian’s E30 survived the journey to the Nurburgring and the journey around the track itself. With the most challenging part of the day over, we just had to drive it back to Brilon now. I never really doubted the legacy of the BMW E30, but by any measure in the modern age, it is at best a slow and clunky German jalopy. Yet there’s something definitely to be said about a car that has existed before the Berlin Wall was torn down and still manages to get to and from, as well as drive on, the Nurburgring while exciting the senses. It was in every way old and unremarkable and in every way an awe-inspiring car. The E30 is one of the best BMWs ever made. My final few days of the trip were spent crossing west Germany and visiting beautiful Cologne before departing. Before then however, I realized that the Nurburgring was on the way from Cologne back to Frankfurt. I had some time to kill and had in mind a very specific place at the Nurburgring I wanted to visit that I didn’t have the opportunity to check out in the two days prior with Florian. In returning to the Nurburgring, I decided to drop by Ring Garage, a small rental racecar shop a few minutes away from the track. While I had expected to see some of Shmee150's cars there, I wasn’t prepared for what happened next. Shmee150 is the Youtube moniker of Tim Burton, a car collector, blogger and lover of all things fast and exclusive who hails from England. He walked in as I was admiring his cars and was gracious enough to share a frame with my mug. German auto brands take on an entirely different image in Europe than in the U.S. Makes such as BMW, Mercedes and Audi are simply major auto brands in their native parts as opposed to the luxury status they uphold in North America. It isn’t difficult to see why then that many German cars in Germany are incredibly average spec hatchbacks and small sedans. As much as I’d love to hit ludicrous speeds on the Autobahn in another BMW M4, the 118i is a car you have to drive around in Europe to appreciate its practicality. The car sips gas (or petrol in Euro English parlance) and at an average converted rate of nearly $6 per gallon for petrol in Germany, fuel efficient cars are a very welcome way to drive across Europe. At the end of the trip, I had driven 2000km in Europe alone. Had I been in an BMW M4, my total bill in petrol costs would have been outrageous. I wouldn’t really call the 118i a luxury car. Its interior is clad with a generous amount of plastic and it drives as a standard hatchback would. Yet mine sported a steering wheel nearly identical to the ones found in new M cars. It had a 6-speed row-your-own with three pedals. What was unexpectedly a delight was the sport mode that sharpened throttle response and best of all, made louder turbo psssh noises. The Ring is made up of a number of well-documented and notorious corners which all have names. The one particular corner I had wanted to visit was named the “Carousel” (or Karussell in German). This corner features a highly banked section with rough and gritty pavement. Much like Laguna Seca’s corkscrew, it is a prominent part of motorsports often featured in video games, photography and for race fans all around the world. Having driven it just two days prior, I wanted to take a photo of the corner from outside the railing. I knew I was somewhere I wasn’t supposed to be. I’d like to think the greatest rewards come by way of ambitious effort. This trip did not go easy but saying I had a good bit of fun would be an understatement. Sure I saved up for months and had to subject myself to spreadsheeting my entire itinerary out just to gauge if the whole thing was even feasible. I had to make things work with the budget I had and the time I had off. I wanted to prove to myself that against everything, I could make it work.